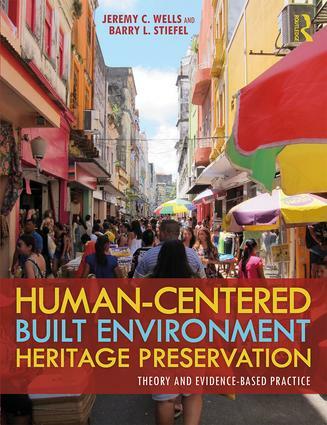 Human-Centered Built Environment Heritage Preservation addresses the question of how a human-centered conservation approach can and should change practice. For the most part, there are few answers to this question because professionals in the heritage conservation field do not use social science research methodologies to manage cultural landscapes, assess historical significance and inform the treatment of building and landscape fabric. With few exceptions, only academic theorists have explored these topics while failing to offer specific, usable guidance on how the social sciences can actually be used by heritage professionals. In exploring the nature of a human-centered heritage conservation practice, we explicitly seek a middle ground between the academy and practice, theory and application, fabric and meanings, conventional and civil experts, and orthodox and heterodox ideas behind practice and research. We do this by positioning this book in a transdisciplinary space between these dichotomies as a way to give voice (and respect) to multiple perspectives without losing sight of our goal that heritage conservation practice should, fundamentally, benefit all people. We believe that this approach is essential for creating an emancipated built heritage conservation practice that must successfully engage very different ontological and epistemological perspectives. How important is this book? As far as we are aware, it is the first book that directly addresses human-centered preservation conceptually and in practice. It explores the applied use of methods from environment/behavior research and environmental psychology along with more general, evidence-based approaches from participatory planning and social science methods. Try Googling the words “human centered preservation“. What do you see? Or, moreover, what don’t you see? The contributing authors to this book represent academics and practitioners and the overall perspective is a balance between theory and practice. We (hopefully) expect this book to appeal to both audiences. Chapter 4: “The Mystery of History and Place: Radical Preservation Revisited,” Jack D. Elliott, Jr. Thank you and congratulations, Jeremy and Barry. I’m certain this will be a great contribution to the literature and look forward to reading the volume! With the recent passing of David Lowenthal, it feels particularly significant.